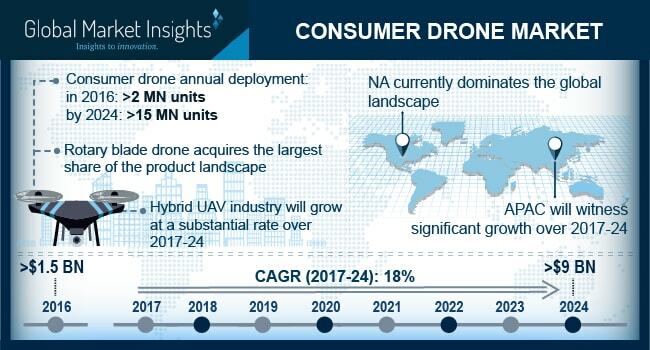 Consumer Drone Market size is set to generate revenue of more than USD 9 billion and exceed 15 million units by 2024; according to a new research report by Global Market Insights, Inc. The consumer drone market is driven by the increasing awareness and understanding of the drone technology. This has enabled the government to take a proactive measure to ensure safety, reliability, and convenience for recreational purposes. The relaxation by the government authorities on the use of drones for recreational and non-recreational purposes is also augmenting the market growth. Furthermore, increasing investment initiatives and supportive government policies will also foster the market growth. The advancements in the drone technology aid the consumer drone market growth. The drone industry is exploring various UAV applications with emphasis on developing fully-autonomous consumer drones. The integration of AI and advanced machine learning algorithms enable independent operation of drones, which is estimated to develop myriad opportunities for the growth of the market. For instance, in 2018, Skydio, an autonomous UAV manufacturer launched consumer drone R1, powered by AI and advanced machine learning algorithms. It is one of the first professional grade drones, which can be flown without any expertise or interference from a human operator. The Hobbyist/Toy market is estimated to gain a substantial growth during the forecast period owing to the technological advancements in the UAV. The population of the countries is widely adopting the looming trend of drones for aerial photography. The advent of high-definition cameras and gimble systems in the drones fuel the demand for the UAVs for photography purposes. Furthermore, advancements in the drone technology have also attracted the attention of gaming enthusiasts. The population is increasingly adopting drones for playing Augmented Reality (AR) games, to get a real-life experience of gaming. Asia Pacific consumer drone market is set to witness an extensive growth during the forecast period in the light of the growing investments in the drone technology in China and other developing economies such as India. The growth of the region is attributed to the rapid increase in the awareness among the population about drones and governments’ relaxation toward the regulations for recreational purposes. Furthermore, the presence of market leaders in the consumer drone space, such as DJI, Yuneec, and Walkera, will also augment the market growth. The major players in the consumer drone market are 3D Robotics, Cheerson Hobby, DJI, Hobbico, Inc., Horizon Hobby, Jianjian Technology, Parrot, Meijiaxin Innovative Technology, Mota Group, Shenzhen Hubsan Technology, SkyTech, SYMA, UDI RC, Walkera Technologies, and Yuneec.